Click 'Add to Cart' now and imagine opening your gift package tomorrow! 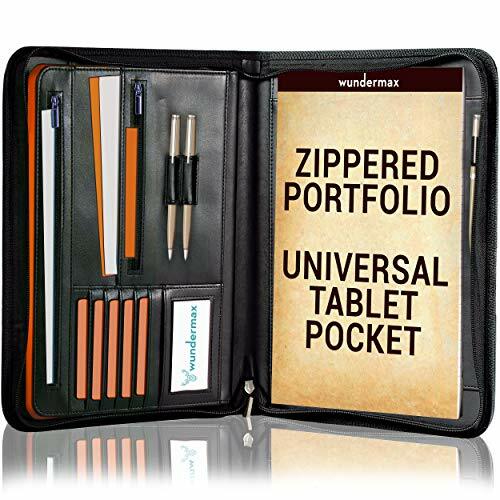 A stylish All-in-One portfolio that will keep all your valuable items safe in one place! The business world is moving faster than ever and the average attention span lasts but seconds. And as an entrepreneur or up-and-coming business owner, you stay busing making moves and making a name for yourself. 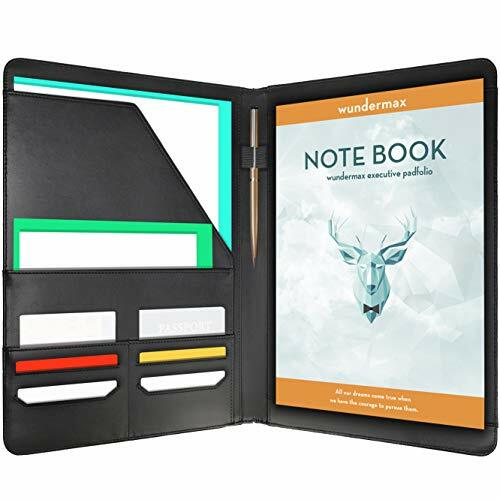 The Wundermax Stylish Padfolio gives you the professional look you need to remain confident and bold with every step. Our unique travel portfolios hold everything from resumes and transcripts to business cards and business proposals; everything you need to close the deal, land the job, or do business at the speed of light. In fact, our portfolio is the most stylish and lightweight portfolio in the market and comes with everything you need in one luxury gift box, including a Portfolio, two Inspirational Bookmarks with sticky notes, one Stylish Notebook! Every pocket, seam, and storage space was crafted specifically for today's busy professional. That's why we've given you a pocket for your tablet or 13" laptop, a transparent pocket to hold your smartphone, and enough room to keep all your documents neatly organized. When you want to achieve more than what the world expects from you, let Wundermax help you lead the way. 1. 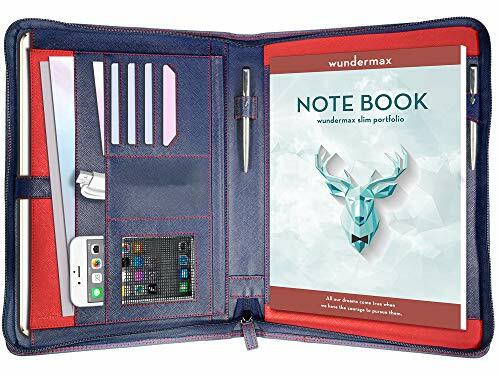 STYLISH PORTFOLIO - This navy blue zippered PU leather padfolio is designed for professionals & entrepreneurs, and compatible for left & right-handed people. 2. AMERICAN VERSATILITY - Including a pocket for iPad Pro/Mini, Macbook Air, Surface Pro, slots for cards, smartphone, pen holders and more. 3. INCLUDED BONUS - Comes in an amazing gift package, including 2 inspiration Bookmarks that holds 5 sticky notes & a beautiful notebook! 4. LEATHER TEXTURE - This luxury hand-crafted padfolio was made to carry all the important stuff in one portfolio and still exude a trendy look. 5. TRUSTED GUARANTEE - Wundermax is committed to superior products and service. If you are unsatisfied with our product, we'll issue you a refund and you keep the padfolio.